Cryptographic Reader Modules for iCLASS SE for development to the next generation platform and open ecosystem. The HID Global Developer Tool Kit (DTK) for the iCLASS SE Reader Module is designed for system integrators, OEM's and solution providers who wish to integrate contactless reading capability into their products. HID's iCLASS SE Reader Module allows integrators to design third party solutions supporting a full range of contactless card technologies including iCLASS Seos, iCLASS SE, Standard iCLASS, HID Prox and MIFARE DESFire EV1®, as well as integration into U.S. Government applications. Supports Secure Identity Object™ - Multi-layer security extending beyond the card technology, providing additional protection to identity data. In-field update of Firmware - Allows feature enhancement in the field, extending the lifecycle of customer installations. Trusted Identity Platform™ (TIP) Enabled - Enables devices to become TIP nodes and benefit from the advantages of a comprehensive and secure ecosystem. Dual Frequency Support - Allows straightforward migration by supporting low and high frequency credentials including iCLASS Seos, iCLASS SE, Standard iCLASS, HID Prox, FeliCa™ MIFARE® Classic and MIFARE DESFire® EV1. 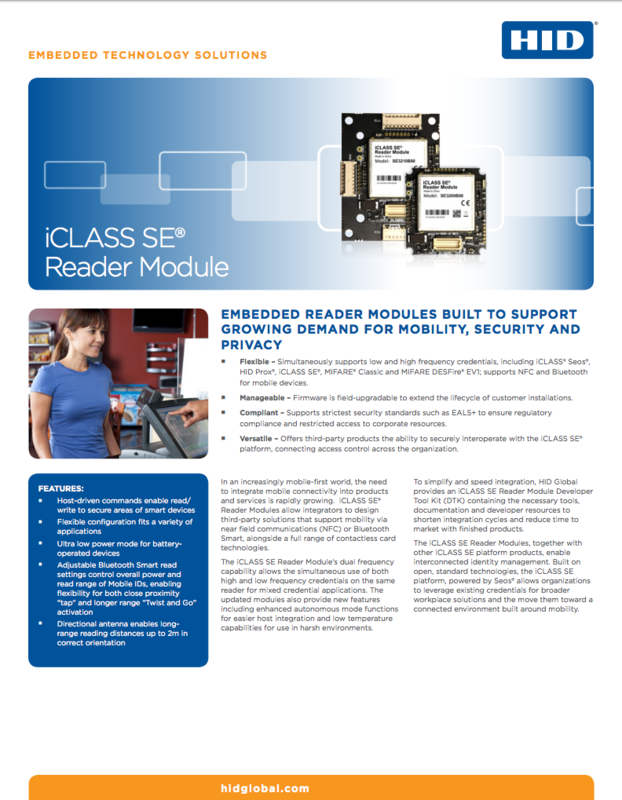 For additional information and to receive the latest updates and product documentation please be sure to register your iCLASS SE Reader Module DTK here. Our Media Center allows you to view press releases, articles on HID and read articles in our industry blog.